I liked the first episode of the Savile Row TV series. But episode two kicks it into touch. Gone are the reverential shots of tailors and their workshops. Gone the image of a British institution comfortable with itself. And gone the unity that attacking Abercrombie & Fitch briefly sparked. Savile Row is trying to modernise itself and market itself. But no one in the Savile Row Bespoke council seems to know what they want (or how to go about it). And they all fail to know what they want in slightly different ways. To ward off competition and retain the purity of Savile Row, the council is drawing up rules about who can qualify as Savile Row Bespoke. Most clothes must be cut and made on the premises, on the Row or within 100 yards of it. 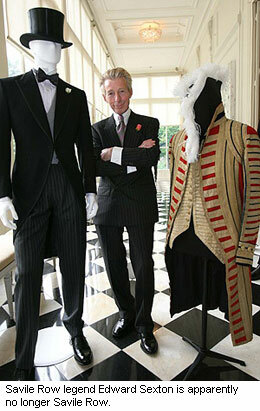 But two tailors, Edward Sexton (of 1960s and Tommy Nutter fame) and Ravi Tailor were excluded. Sexton had moved to a Knightsbridge address a while ago, and Ravi was forced out after a mistaken partnership with Japanese jeans company Evisu. Both were judged to be more than 100 yards away (despite a heartbreaking scene when Ravi’s young son paces out 78 yards to the new store). But surely the point of the association was to prevent new tailors using the Savile Row name, and keep the spirit of the brand pure. It was meant to be forward-looking. Little seems to be gained from excluding these two historical names from the list because of rules just invented. Moreover, different members of the council seem to have different views of the point of this rule, and some even think it is 50 yards, rather than 100. 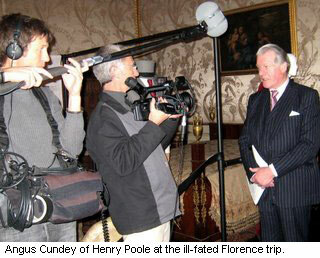 The project seems even more ridiculous after a section following Henry Poole’s expansion in China. They have one store already in Beijing and are setting up another close by, both managed by a Chinese tailor. Not only is this nowhere near Savile Row, but the staff working and cutting in the new store are not Henry Poole staff. They use cloth sent from England, but no mention is made of the training Chinese staff receive. It is also instructive that no mention is made in the programme of two Savile Row brands that have successfully expanded their marketing and appeal – Kilgour and Richard James. Kilgour recently began offering a service that uses Chinese tailors that are hired and trained by Kilgour, but work in China. This cuts around £1000 off the price of a suit. When this is mentioned to Henry Poole cutter Angus Cundey on an ill-fated branding exercise in Florence (their designer produces table placings with “Savile Road” emblazoned on them) he disowns any suggestion that he has operations in China. Apparently it is better to have a store there but no workers that export work back to the UK, which seems a little academic. The story of Savile Row’s tailors and their expansion is a fascinating one, but you can’t help feeling that with so many individuals among them, they would be better off branding individually. Follow the examples of Richard James and Kilgour, or what’s left will be a vague “save the Row” campaign, not a modern business plan. You can follow the discussion on Savile Row splutters abroad by entering your email address in the box below. You will then receive an email every time a new comment is added. These will also contain a link to a page where you can stop the alerts, and remove all of your related data from the site.